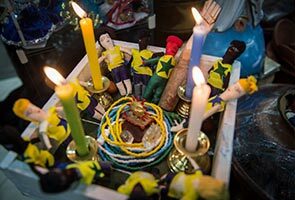 RIO DE JANEIRO: Voodoo dolls of Colombian star James Rodriguez, candles in Brazil colors and prayers to deities, Neymar and co are getting full support from the World Cup hosts' Afro-Brazilian religions. Before every game, Helio Sillman lights four yellow, green and blue candles in the colors of the national flag and places them in a rectangular box representing a football pitch. He places dolls inside and sends them "strength and energy," with the help of orixas, the gods of macumba and other religions that mix Roman Catholic and African beliefs. "I place charms made of grains to bring them luck, an amulet to neutralize negative vibes, a cristal and a sun to give them energy, and in the middle orixa necklaces to protect them," Sillman told AFP. He placed his voodoo altar at the entrance of his store, World of Orixas, in a popular market of Madureira, a northern Rio de Janeiro neighborhood. He sells drums for Candomble, Macumba and Umbanda ceremonies. Four other dolls rested on a ceramic plate on the floor, with legs tied and eyes covered. They represent Croatia, Mexico, Cameroon and Chile. "It is the four teams that Brazil has taken out of the cup," Sillman said as he hit the dolls and held their faces down on the plate to suffocate them. "That's how I neutralize rival teams before games. I take the leading player and tie his legs to prevent him from moving on the pitch," he said. "When the leader doesn't do well, the entire team suffers." As Brazil prepared to play Colombia in Friday's quarter-final, Sillman made two dolls representing Colombia's Rodriguez, the World Cup's leading scorer, and his teammate Juan Cuadrado. He puts on their team's yellow jersey and ties their feet. During the national anthem, he will light candles "that must last the entire game." Though Brazil is the world's biggest Catholic nation, millions of Brazilians will, following Christmas services, dress in white and head off on New Year's eve to make offering to Yemanja, goddess of the sea for followers of Afro-Brazilian religion Candomblé. Although the church, particularly the Evangelical movement, frowns on such things, many Brazilians have a range of superstitions ranging from believing in spirits to reincarnation. Sillman has run three shops for 30 years now -- the establishments sit side by side with a sea of stores selling Brazilian football regalia and various party items. His rituals are designed, he says, to "bring spiritual strength to the Seleçao" as a World Cup where the level is high across the board means the team "needs stars such as Neymar, skill, but also luck. And that's where I come in,"
He adds that when a Candomble priest, known as a Pai de Santo, comes to visit, and buy items for ceremonies he takes the opportunity to ask him to "touch, to talk to the Selecao so that their life force becomes stronger." Sillman, whose footballing rituals date back to the 2006 World Cup in Germany, adds: "That is why we have already been world champions five times. Brazil has a lot of life force, positive thinking -- the people are optimistic by nature."